Roses are commonly seen climbing a wall or an arbor. 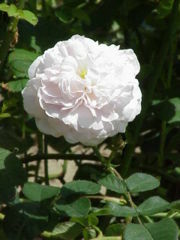 For this type of landscape, the true climbing rose is the best choice. True climbing roses can be trained to many different effects, including climbing up the length of the structure, or accenting the tops and sides of a wall or building. If you want a great background rose bush, the Polyantha or modern day Floribunda is a perfect match. These rose bushes have large sprays of blooms and can go well in a garden next to the house or anywhere that your landscape needs color. 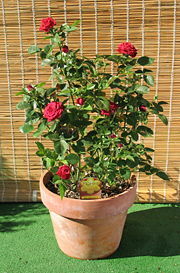 Some rose bushes are rather large and should be planted at the back of your garden, but there are miniature or low growing China roses that are perfect to plant in front of other plants. Roses can even be used as hedges, with modern Shrub roses and Rugosa roses being excellent choices. Color is an important consideration for your roses and you need to think about where you will be planting the roses and what color is needed for that area. Luckily, roses come in many shapes, sizes and colors so there is a rose for every spot in the garden. When picking a rose plant for a certain area, be sure that it complimentsthe surrounding landscape. For instance, a spray of plain white tea roses can be striking against a dark red brick home, or an arrangement of pink roses can be the perfect compliment to a stone or marble entranceway. With so many colors of roses to choose from, it should be easy to find colors that compliment and enhance any decorating scheme. Due to the large variety, roses work well in every concievable place in the garden and can be a beautiful part of an overall landscape of plants and flowers. There is also a rose for every climate so gardeners everywhere can enjoy this beautiful and timeless flower.